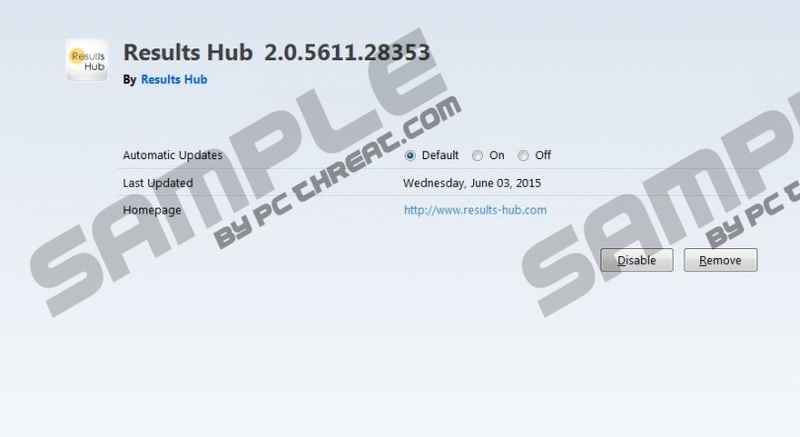 Results Hub is one more annoying adware program that should be removed without any hesitation as soon as it is found running on your PC. Do not get fooled by the devious marketing strategies employed by the vendors of this application. In most cases, Results Hub is marketed as an application that should be used to improve your Internet searches. At first these statements could sound quite tempting, but it has to be noted that in reality Results Hub is not an application that can be trusted entirely. It does not perform the way it should and in most cases just causes endless annoyance. To restore the standard functionality and proper security of your operating system you will need to conduct a complete manual removal of Results Hub; use the removal guide provided below without any hesitation. As soon as this intrusive adware gains access to your PC, it will instantly flood your web browser, whether it is Google Chrome, Internet Explorer, or Mozilla Firefox, with a ton of unwanted third-party content. In most cases, the third-party content is presented as various banner ads and annoying pop-ups. It goes without saying that this invasive activity promoted by Results Hub will make your life miserable because you will need to fight through numerous unwanted ads and pop-ups every single time you browse the web. As long as this intrusive adware is active on your PC, browsing the web the way you are used to will not be possible. In order to stop this annoying activity, you will need to conduct a thorough removal of Results Hub as soon as possible. If you fail to do so, the intrusive activity promoted by this adware will continue to bother you. During the research something much more alarming about Results Hub has been discovered; some ads provided by this invasive adware program could be implemented with redirect links. This is a very dangerous situation because it could have devastating outcomes. By clicking on an ad presented by Results Hub, you risk being taken to suspicious third-party websites. You could end up on a website running an arbitrary code execution exploit, meaning that just landing on such a site could be enough to get your operating system infected with some unknown malware. In other instances, it has been noticed that you could be redirected to fake online stores that were created by cyber criminals to steal your credit card data. Often such websites are designed to look like legitimate online shops while in reality they do not provide any services. If you come across a suspicious looking web store, refrain from making any purchase before learning as much as possible about the shop itself. To avoid such dangerous cases you need to remove Results Hub immediately; otherwise, devastating consequences could be just around the corner. The removal procedure for Results Hub should be your utmost priority because it is your best bet to keep your PC safe and secure. Make sure not to skip any steps because it is of paramount importance to delete Results Hub entirely. To be sure that every single bit of Results Hub has been removed, you will need to conduct an in-depth analysis of your PC for potential leftovers as soon as manual removal is executed. Select Results Hub and then click Uninstall. Quick & tested solution for Results Hub removal.